« 3 sudden extra jobs? Recent Wednesday, I took one day off work to help Xinwen promoting Go in Taylors College, Sunway. 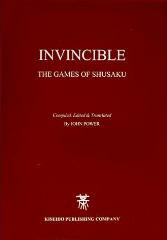 He was the president of Intellectual Club, which the main activities included playing Go and Shogi. I brought along a number of books, and a laptop and wore Malaysia Weiqi Association T-Shirt that made me look fat. Well anyway, the event started at 11 a.m. until 3p.m. and we got a number of people interested in the game. Xinwen and Shuwen did most of the talking whereas me, Alex, Jimmy, Wynes and Billy spent more time playing instead ! Haha couldn’t resist. Hopefully we can do more demonstrations in the future. Some Shogi guy explaining some Shogi stuff to someone interested in Shogi. Can the shirt be blamed for my fat face? Xinwen, wearing official blue Oza Asian tournament 2008 shirt.